As soon as I read the headline, a thousand thoughts went through my mind. Did I buy enough bulbs this spring for fall planting? People are hoarding bulbs. Why are they hoarding flower bulbs? Do they know something I don't know? Is there a shortage of bulbs this fall? Maybe I should go buy some more now? 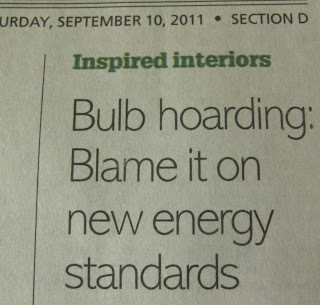 People are hoarding bulbs. Should I send emails to make sure the bulbs I pre-ordered in the spring are really going to be shipped to me this fall? Oh, dear. I need to let other gardeners know. But should I wait until after I've made sure I have enough bulbs to tell them? 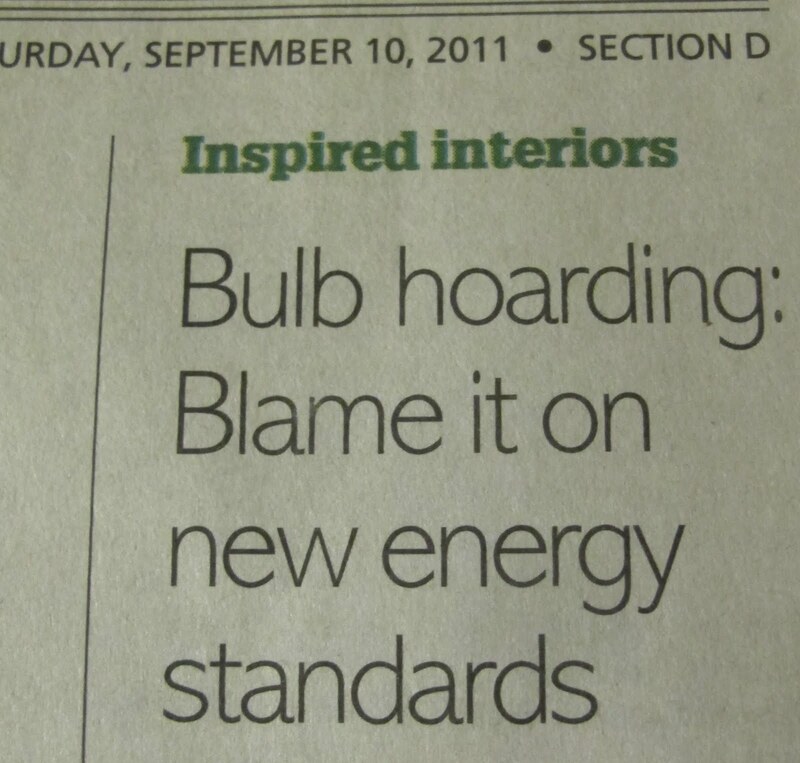 After all people are hoarding bulbs. What do they know that I don't know? Then I finished reading the rest of the headline. Oh, they are hoarding light bulbs. Well, never mind then. Whew. That was a close call. Really, seriously, who would hoard flower bulbs. It seems ridiculous to even consider. But then again, maybe I should double-check on those spring flowering bulbs I pre-ordered? I'm sure when I ordered them in the spring, I thought I was ordering enough. Now I'm not so sure. I think I'll need a few more. After all, every spring when the bulbs come up, I never think I have enough of them. Yes, Dr. Hortfreud? What a surprise to hear from you. Carol, I'm here because you seem a bit traumatized by this bulb article, and it isn't even about flower bulbs. Well, wouldn't it scare you if you thought there weren't going to be enough flower bulbs to go around this fall? Maybe a little, but I think you've gone a bit overboard. Why don't you go look at your pre-orders and see what you have coming before you go off and buy even more bulbs? Dr. Hortfreud, that sounds like a good idea, a very practical suggestion. But I'm still going to buy more bulbs. Yikes! I'm in trouble. I didn't order bulbs in the spring and I don't have any replacement incandescent bulbs either. I saw some rain lily bulbs over at the NAtural Gardener yesterday and couldn't believe the price of the. $4.99 each. Too rich for me. I'l have to stick with the native ones. When I was in school we had a large area of grass planted with spring bulbs. There was a simple sign which read 'bulbs' so that we wouldn't walk on the grass when they were dormant. We hosted a 6th form conference at the school and some pranksters (boys I'll bet) removed light bulbs from inside the school and planted them in the ground. Our headmistress was not amused. OK, now you've got me worried. If you and Dee are going off to buy more bulbs, our friend from Idaho won't be far behind. Then there really may be a shortage. So I should order mine now! Thanks for the giggle. And I would have thought exactly the same thing. This made me laugh out loud, Carol, but also made me worry that not nearly enough bulbs were pre-ordered. It happens every year. Sounded like some aggie joke. It seems to me that the only time you can have too many bulbs is when you can't plant them all. Otherwise, the more the better. Go on, you know you want to. Bulbs are expensive, too! I had just figured out what I was going to order this year, when I realized it would cost me over $100 for three types of bulbs. Needless to say, my plans have been scaled back. If you want them...just do it !! !